This meticulously researched social history should be welcomed by specialists in British and European women's history. Vickery (British women's history, Univ. of London) challenges the standard argument that once the industrial revolution took production out of the home, women's lives were marginalized in the domestic sphere. Using the letters, diaries, and account books of more than 100 women from the "genteel" classes, she theorizes that women's activities actually expanded as they involved themselves in new areas of community life. Indeed, she concludes that the struggles of the Victorian suffragettes may have stemmed not from a sense of oppression but from a desire to expand the gains of their Georgian predecessors. Unfortunately, Vickery's insistence on proving her provocative thesis overwhelms the richness of the descriptive material she presents: there is good information here on household management, servants, material culture, shopping and consumption, and female attitudes on courtship, pregnancy, motherhood, and child rearing. This book is the most recent in my bout of Georgian era gluttony. I think it may be the last for at least a little while, though I have gotten my grubby hands on at least five other non-fiction books about the era since I last posted. I have grand visions of myself having one of the foremost collections of authoritative literature on 18th and 19th century England by the end of my life. I'll have to keep on top of that! 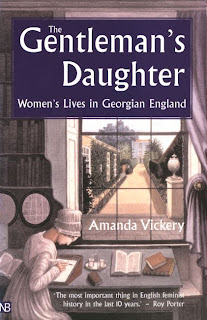 Amanda Vickery's book is about the life of genteel (note that genteel does not equal aristocratic) women in the 18th and early part of the 19th century. It is divided into seven chapters that roughly coincide with major events and duties in a lady's life (courtship, marriage, motherhood, householding, shopping and entertainment). Vickery's thesis is that women were not marginalized in society during the 18th century, and did not operate in separate spheres leading up to the Victorian era. (She does not touch the Victorian era at all.) She proves this point well by sharing anecdotes from letters and books, newspapers and prints. But the book is also littered with jewels of information about all aspects of female life. It is always implied that people in prior centuries had better spelling and grammatical skills than people today. When you really consider this, it's pretty unlikely; how many people in prior centuries were really that educated to write with proper grammar? Especially women. In the mid-18th century, it is estimated that 81% of upper-class women were literate. Judging by the letters Vickery quotes in her book, this literacy does not translate to good spelling. Granted, spelling may have changed a bit from the 1750s to the 2000s. But not that much. It was very interesting (and disturbing) to see. Clearly, spelling has never been a real priority with people! Additionally, the book has several grammatical errors unrelated to citations from its sources. That gets very annoying. My favorite chapter was that on childbirth and motherhood. Sudha, if you are reading, there is a really fascinating excerpt on how midwives were slowly replaced by "male midwives," and then by physicians. "Ladies of quality" in the 18th and 19th centuries are given the short end of the stick as mothers. The belief persists that they were rarely invested in their children's lives; this is based mainly on the fact that many did not breast feed and apparently were too busy leading very busy lives to bother with their children. (If that is the criteria, then God only knows how mothers today would rate.) Vickery proves this completely wrong, which is gratifying, to say the least. Vickery's book can be slow-going at times due to the large number of citations that she makes in it, but that is the nature of an academic work. It is also full of interesting tidbits; for example, there was a ladies' debating society in the late 1700s which, among other things, debated whether a woman pledging obedience to her husband in her wedding vows required her to always follow his orders. It is definitely more in-depth in its material than many other books, so if you enjoy delving into history, this is for you. This sounds like a wonderful book for a woman studies course and for women in general. Thanks for you though provoking review! I love books that give insights to the daily life of people in the past. I love the bits in historical novels about meals, servants, shopping, even dressing and bodily functions! I am totally going to read this. Thanks for the great review! PS: Come visit me again, I forgot to take you to the mystery and fantasy only bookstore! Sounds like a really great, informative read! Like you, I'm fascinated by this era of English history :) In fact, "fascinated" probably isn't the right word. I'm more like obsessed! :) Going to hang out at your blog for a while and check out your similar recommends -- and then BookMooch wishlist, here I come! I agree with the above poster, this book sounds totally fascinating. I too love to read about the daily concerns and tidbits of other eras. This sounds like a must read for me. Great review! Thanks for posting this, I've put it on my wishlist. It does sound like a fascinating read. I always wonder what it would be like to live in another age. Sounds really fascinating. Women's lives in the Edwardian period also interests me, so I def. will try to look at this one, since I don't know as much about the Georgian period.